Well, after 14 years I have finally left school ! I know that sounds strange, but I refer to the 14 years I have spent as unofficial Chaplain to Aldercar Community Language College (formerly Aldercar Secondary). 14 years ago in September I stood outside the school gates with my colleagues Pastor John Parker (Baptist Pastor) and Rev Ian Jonas (Anglican Vicar) at the start of the school year and we prayed for the school, for its safety, its wholesomeness, for the pupils and for the staff. A month later I was invited in to take my first school assembly and the rest, as they say, is history. That history has comprised carrying out between one and two assemblies every week, becoming a school Governor for eight years, helping out with the GCSE humanities occasionally, running a Christian lunch time club, and supporting the school in activities and in any way I could. In that time I`ve pretended to eat dog food, used magic bags, magic tricks, appeared once dressed only in fig leaves ( a lot of them) and generally tried to bring the Gospel message in easy understandable ways. Many of the youngsters I’ve known since 5 years old and younger (I’ve baptised some of them ! ), through earlier connections with Aldercar Infants, Sedgewick Street Infants and Langley Mill Juniors and it has been a real privilege to see them grow and to have journeyed their whole school lives with them. It was some of these students who, at the age of five, inspired me to learn sign language so that I could communicate with them. More latterly that hasn`t happened with being in Ripley, but I’ve seen the Codnor Primary school youngsters come through. It has been a tearful morning today; the staff turned out for my assembly and some lovely things were said, Joe Bancroft spoke powerfully about me being the best friend a school could have, Tony Cooper (the Principal) spoke of warmth and generosity, of support and wisdom. Kathy Hardy gave me a generous hug before the assembly began saying that she was going to lock herself in her office as it was too emotional. Sadly David Windsor couldn’t be with us as he was in France on a school trip (the length some Nottingham Forest supporters will go to avoid the success of Newcastle United). I’ve received cards, bottles of wine, a book about the school, a pen and a tie pin. As I reflect upon this kindness and this generosity, I have to record that every nice thing they said about me I could and did say about them. The staff have become good friends, from the maintenance staff to the teaching staff. They have been supportive, interested, generous in their time and energy, and they have been loyal to me. I really appreciate what they have done for my Ministry in this area. The pupils are brilliant; many people will sniff and look down their noses at people from this part of Derbyshire and Nottinghamshire, but if they would bring themselves to look deeper into the lives of people they would find great people. I have tried over the years to instill into these students that they should be proud of their school and their area, that they can hold their heads up high, look people in the eye and say “I live in a great area and I’ve attended a great school”. I hope and pray that I’ve given them esteem and respect, for they’ve given me so much over the years. I can feel the tears coming on again……………. Thank you Aldercar for everything you’ve given me. I`ve recently completed a Methodist Supervisors training course. Over three sessions we looked at this whole area of supervision and we had to keep a journal. I`ve recorded the three sessions and I present them here if anyone is interested; if not then just skip it and I`ll never know !! Enjoyed the opportunity to share with others, to learn from them and hopefully to give them something as well. Surprised at the size of the list of positive and non-positive experiences of supervision between us. Brought back memories of my own supervision when I was a probationer. Not particularly good. Having said that I feel that as I look at the positive side of the list, I fit more on the side of an encourager. I’m a person who deals with practical matters and so was interested in the concept of regular, structured meetings with the probationer and the possibility of keeping a record. Perhaps this is an area I’ve fallen short of. I appreciated how the purpose of the meeting was to benefit the probationer, or supervisee, but that out of it the supervisor should also grow. Accountability should come from the Methodist Theology of Corporate Accountability to each other. Found myself very much challenged by the idea of supervision as a holy activity done for the mission of the Church. Coming from a civil service background supervision is about “getting the job done”, but this is a different way of thinking. Perhaps this might help me understand more about how to supervise as I go into a new staff situation of 6 members of staff and a co-superintendent. This may have been the biggest revelation for me and I maybe need to spend more time on this. I don’t feel that I have supervised before, in my civil service way, as Ministry isn’t about specific jobs for specific times, but is more of a way of life. However, my nature is always to encourage others and yet I maybe need to find more of that cutting edge, challenging side, to my nature in moving others forward and so moving myself. This idea of making probationers `worthy` of Ordination is a particular challenge as it raises questions about my own ministry; is it `worthy`? Do I relate in a `worthy` way to my colleagues and congregations ? I believe I do, but perhaps this needs to be explored more. What does `being worthy` actually mean ? Today was NATIONAL LEARNING AT WORK day; an interesting concept upon which to have a training day. A good reminder that there`s always something new to learn. Interesting time looking at interventions and exploring how intervention is not necessarily interference, and it should be a positive thing. Herons six categories of intervention were interesting, Directive, Informing, Confrontational (all listed as Authoratitive by Lindsay Jordan, educational developer) and Releasing tension, Eliciting and Supporting (all listed as Facilitative by Lindsay Jordan). What is natural for me and what would I avoid ? Part of intervention is also about showing how to interpret the rules and teaching discernment. This is more of how I have envisaged supervision within Ministry, as a helping role. Found the time spent on power to be fascinating, including the personal power emanating from our own personality. The supervisors power coming from a position of knowledge, of having achieved things that the Probationer hasn`t yet, experience, personal contacts and awareness of responsibilities. The probationers power comes from fresh (up to date) knowledge, personal contacts, the momentum of Ordination and how much information they choose to impart. The time we spent on different learning styles was well spent and clearly explained. I`ve done some of this before so I was well aware that my description would be along the lines of an `active reflector`, someone who “gets on with it” and then reflects on the experience. However, I liked the emphasis on how all the different learning styles are needed at different times; Activist, Reflector, Pragmatist, Theorist. We concluded by looking at the different tools required in supervision. Two styles of report, A) Critical Incident Report is about an incident important to the supervisee that can be examined and reflected upon and B) Verbatim Report whereby a written (or spoken) account of an incident/conversation can help to raise questions and reflections. We began with our verbatim reports in groups of three. I found this fascinating and as a person who usually hates role play this was refreshing. We didn`t `act` out any parts but simply read the report, each reading a different persons part. I found myself actively looking to support the person involved, looking to help with a way forward and thinking about the persons development afterwards. We looked at the differences between a supervisor and a probationer. I`ve kept the full list in my notes, but it covered areas such as age, politics, gender, theology, perception of calling, learning style and family circumstances. A long and lengthy list but one in which we felt that human beings are aware of all these things automatically every day. Our examination of Meredith Belbins work on teams was very good. Personality and roles within a team affect relationships, working practise, outcomes and the sense that once someone is aware of their place within a team then they will perform according to their abilities. Comforted by the thought that no one is perfect, but that a perfect team can be created. I wonder if there is any mileage in trying to get our new Circuit team to consider this subject ? Out of this work comes the theory that if we can understand the person then we can more easily help them to develop and blossom; the Holy Spirit is a transforming Spirit. We must also be aware that the context can change the dynamics of a team, new person coming in, transfer to a new circuit but there is still the need to understand the person being supervised in order for them to grow. If dynamics have changed then we need to examine how this has affected the supervisee. I was interested to hear the rationale behind the Myers-Biggs and it dealt with much of my scepticism; the idea that thought processes are about taking in information or about organising information and then about how we handle it. As we come to the end of the course I feel that it has been very worthwhile, it has challenged my thinking and made me more aware of how to approach relationships with colleagues and with those I supervise. We`ve been to see two houses today after last weeks fell through. No 1 is very large but seems somewhat shabby and unfinished. Certainly if there was money to do it up it could be ideal, but a fair amount of work needs doing. There is real potential but not necessarily the time to fulfil the potential as we need to move as soon as possible. I start work in the new Circuit on September 1st. Thankfully the Amber Valley Circuit are going to let us stay in this Manse as long as we need to so that takes some pressure off. Number 2 which is round the corner from the one that fell through seems to be even better than the first one that fell through. It has a larger feel to it, its private and not overlooked, it will need minimal decoration (only to get rid of it being all magnolia) and the entrance hall carpet is a very light colour so laminate could still be considered. The only down side is the lack of a study. Whilst the dining room is big enough Alison and I would probably take over a bedroom and use that as a study. It would still leave four good-sized bedrooms (two with en suites to die for !) If in the future a Minister didn`t want to use a bedroom the garage could be converted as it has access from the inside of the house We think there is real potential in both houses but our preference (and I suspect the Circuits) would be for the second house. The couple here are selling because they think it’s too big for them and they are buying a brand new property therefore there is no chain. Notice how I have been good and kept to Methodist Conference guidelines on using social networking sites and not revealing private details. I certainly don’t want the owners of the first house suing us for criticising their property in a public forum !! Life truly is a roller coaster. Alison`s Ordination on Sunday; she then found out that there’s the threat of redundancy on Monday; Rebecca and Jamie’s dog was put to sleep on Wednesday; The new house fell through on Wednesday…………. Life can only get better ! I really am ready for a holiday next week. The busyness of the week continues…………………. By no means as important as Alison’s Ordination and definitely not on a par with the pomp and circumstance of Derby Cathedral, but last night was an important evening for me as I was officially inducted as President of West Ashfield Rotary Club. 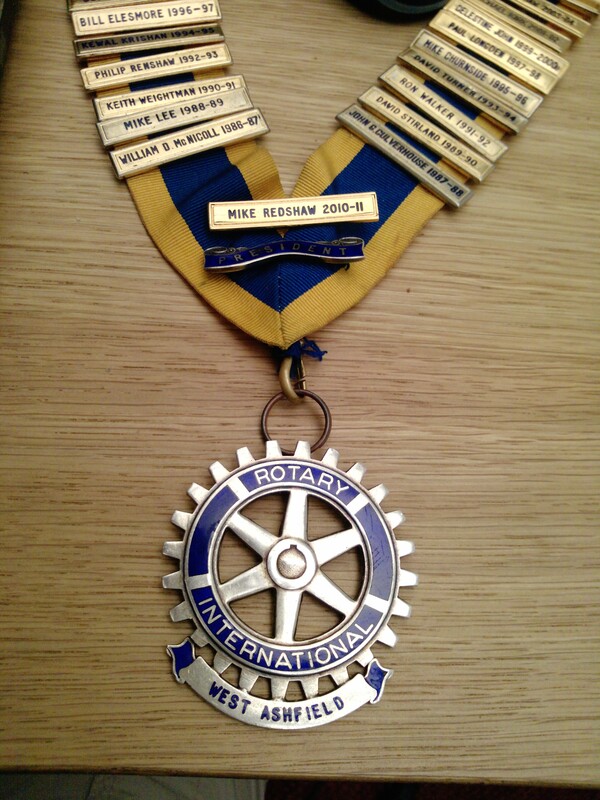 As many of you know I`ve been a stand-in President since January after Graham moved to the Isle of Wight, but last night brought what the club calls `the change over` night when the Presidents of Rotary and Inner Wheel (the ladies club) are inducted. As I didn`t have an outgoing President I asked the previous years President to come back and do the job of handing me the badge of office that I`ve been wearing for the last 6 months ! This time with my name badge on it ! We began as usual by welcoming the ladies of Inner Wheel amongst us, having our dinner, receiving a short speech by Terry Wilson in which he congratulated Alison on her Ordination (nice touch I thought) and then I handed over to President Pat of the Inner Wheel who inducted President Margaret and her team for the coming year. The Inner Wheel is a fine organisation in its own right; it began life simply as a meeting of the wives of men in the Rotary club, but it too has grown into a wonderful international work and often in many ways achieves more and better charitable work than most Rotary Clubs. After Margaret had introduced her team, her husband (as a previous President) inducted me and I then proceeded to welcome my team of John as Senior Vice President and peter as Junior Vice President, alongside my treasurer, secretary and committee chairmen. We then had a wonderful, humorous speech from Phil who is our sergeant-at-arms and responsible for `in-house` fund raising with his series of fines for misdemeanours such as 20p for starting the meeting early, late or even on time ! It’s a lovely bit of fun to end a Rotary meeting with and it raises funds for Rotary Foundation, our own charity. Although I`ve been doing the job for 6 months now, it really felt as though I had arrived last night. It is a terrific responsibility to be worthy of such an accolade (although it was mainly because no one else wanted the job !) and to be given the trust of the men of the club. I appreciate it and trust that I will respond appropriately. Well, we’ve come to the end of a very long day, but most enjoyable and memorable. From the moment of waking up to right now its been a simply wonderful day, filled with memories and joys. The Cathedral was gloriously packed and it seemed as though the whole of the Scope charity shop manager and volunteers had turned out along with people from our previous Church of St. Andrew`s Langley Mill and from Alisons former Church of All Saints, Ripley. Alongside this was our family travelling from as far afield as Brighton and the North East, along with Judith our friend from Oldham. It was all a wonderful gesture of support from friends and family. The weather was very windy but the sun shone and the rain kept off. The Archdeacon Emeritus of Lincoln spoke well; Bishop Humphrey was his usual warm, friendly self, the Ordinands did very well to remember their places and look calm, the singing was wonderful and very moving. I admit that I managed to be a real wuss and I shed a few tears when Alison came down the aisle and again when the Bishop laid hands on her to Ordain her. Powerful, powerful stuff. Probably the most moving part was towards the end when the Bishop removed his robes and proceeded to wash the feet of all the Ordinands in a gesture of servanthood, reminding us all of what Jesus himself did with his disciples in the Gospel of John. After washing Alison’s feet he looked up at her and said “thank~you”. I thought that was a magnificent gesture and it really felt as though he considered what he had done to be a privilege that Alison had bestowed on him. Back to Alisons former Church of All Saints, Ripley where she has worshipped for the last six years as they put a lovely Quiche and salad spread on for us all. They certainly did Alison proud. Then this evening onto her new Church of St. Marys Crich where she was interviewed and shared in taking the worship. Again it was a privilege for us to be there. Alison has been faithful to her calling from God, taking it seriously and giving it the right amount of priority in her life. I have been pleased today to have been regarded as “Alisons husband”. Twenty years ago I felt that God was calling us into a joint ministry. For all that time we have seen it in terms of Alisons loyal support of my Ministry, but now it feels as though Gods promise has come true for us. Isn’t God wonderful ? Please pray for Alison as she prepares for her Ordination at Derby Cathedral in the morning.